MWS-CAS-3A/B Microwave Rangefinder - HiTECH Technologies, Inc. The MWS-CAS-3A/B Micro-Robo is a microwave range finder specifically for use on overhead cranes as a crash avoidance sensor. The sensor and reflector are installed face-to-face on adjacent overhead cranes running on the same rails. When one crane enters the preset slowing or stopping distances, the sensor will output a signal for the crane to either slow down or stop. Distance-measurement type, two outputs. The distance adjustment is simple because the sensor measures distance and outputs a signal to either slow down or stop the crane. Analog output The measured distance is output as an analog current. 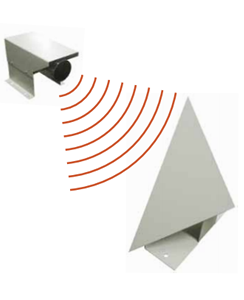 Unaffected by adverse environments Microwaves are generally unaffected by environmental conditions, thus this sensor is unaffected by rain, wind, snow, frost, heavy dust, smoke or vapor. No beam slippage Beam adjustment is easy because the beam is conical-shaped and there will be no errors caused by slipping of the beam. No set-to-set interference This permits use of multiple Micro-Robos in close proximity to each other. For use on overhead cranes as a crash avoidance sensor.